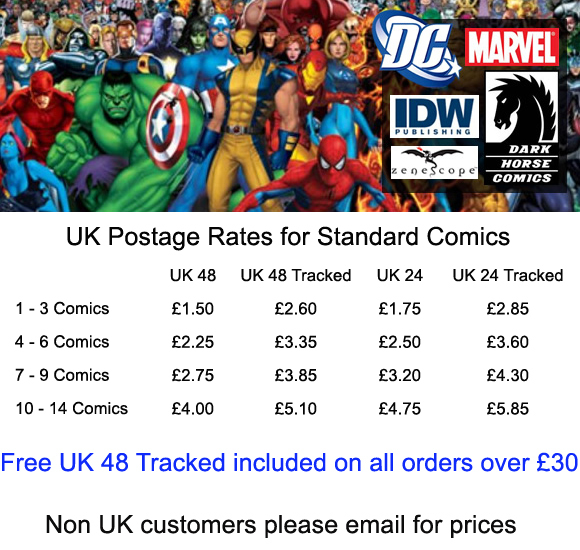 Wolfcomics UK online comic book shop. Welcome to your friendly neighbourhood online comic book shop. Wolfcomics the one stop shop for high grade back issues and CGC graded comic books. All scans are of the comics you will receive. We do not use stock photos. Amazing Spider-Man #1 Sunburst Variant (1999 Series) - CGC 9.8. Batman #1 Aspen 2nd Print Variant (2016 Series) - CGC 9.6. Carnage Mind Bomb #1 (1996 Series) - CGC 9.8. Spider-Men II #1 Aspen Variant A (2017 Series) - CGC 9.8. Spider-Men II #1 Aspen Variant B (2017 Series) - CGC 9.8. Spider-Men II #1 Aspen Variant C (2017 Series) Virgin Variant - CGC 9.8. Venom #2 Dell Otto Variant (2017 Series) - CGC 9.8. Venom #2 Dell Otto Black and White Variant (2017 Series) - CGC 9.8. Venom #2 Dell Otto Virgin Variant (2017 Series) - CGC 9.8. Weapon X #1 Aspen Variant A (2017 Series) - CGC 9.8. Please see the New in Stock section for our latest selection.